A driver became ill after encountering a light shaped like a "massive star", government UFO files released reveal. In his account to police he described how a "tube of light" surrounded his car in Ebbw Vale, Blaenau Gwent, and later how he was sick. Such an episode is classed by ufologists as a "close encounter of the second kind" - UFO sighting followed by an associated physical effect. It was one of many reports alongside countless "light in the sky" sightings, episodes in which eyewitnesses claim some form of physical effect and even contact with an alien being, in the National Archive files made public for the first time. The man in Ebbw Vale said he was driving on a clear and dry night around 2240 GMT when he encountered the UFO. His identity has been withheld, but his report to police shows he was from Newport. He claimed his car was surrounded for five minutes by a "tube of light" which swept towards him from the north east. During this time both his radio and mobile phone stopped working. The report goes on to describe the encounter: "First sighting seemed like a "massive star" moving towards the car. "[The man] was able to walk through the light which was very bright. There was no sound, no aircraft or helicopter noise, and besides feeling ill was very frightened." The report said the man's car was left covered in "dust and dirt". 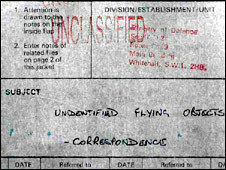 The National Archives release is part of a three-year project by the MoD and the National Archives to release files related to UFOs on the National Archives website.